As a special needs parent, I had a crash course in learning all about sensory processing issues for tiny humans. For whatever reasons may exist, for some kids the literal roughness and loudness of the world is too much for their little bodies and minds to handle. One of the fail-safe items my child would gravitate towards when overwhelmed in their adaptive preschool was the sensory table. This massive wooden box on wheels contained a large, deep tray filled with different themed things — it may be sand and small beach toys and sea shells one week, rice with bright plastic dinosaurs and Easter eggs the next, and rainbow macaroni with construction vehicles after that. My child loved the textures and would dive hands first into the foreign substances, otherwise an unheard of feat for my little one. The imaginative play that would take place at that table always fascinated me, as did watching the minds of the children in the class work on a skill so many of us take for granted. And as any parent would do, especially when your child doesn’t react to “normal” kid things, I researched getting a sensory table at home … and promptly lost hope while looking at teaching supply catalogs and adaptive services websites. Even with grants and applying for assistance from government agencies, the nice big solid table was certainly out of my measly budget, so I’d have to save the magical sensory play time with my child for just at school. Imagine how THRILLED I was to find this (albeit much smaller) sensory table tutorial from A Teaching Mommy for just $30 … and 30 minutes of construction time. 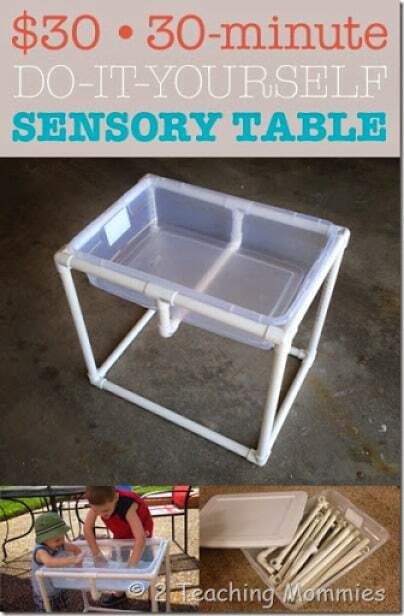 Not only would this project be a great and easy build with your kids, but no matter where they may or may not fall on the special needs spectrum, this table is sure to be a hit. Take it outside on a hot summer day and fill it with ice and let them explore hot versus cold. Fill it with colored sand and play with mixing different colors to see what happens. Even filling it with small gravel or garden dirt could pose some very interesting and creative play times for kids of all abilities. If you’re stuck inside, you can use all sorts of things — uncooked pasta or rice, marbles, beads — anything that moves with pressure and can stimulate sensory output without overwhelming a kid. Bonus points for the table being easily interchangeable with different tubs for different activities, and for being fully collapsible when not in use, as well. No matter how you play with your new sensory table, you’ll be amazed at what your kids will come up with when given the license to learn through their hands, neurotypical or not.